The stomach flu is the second-most common illness in the United States, so it's highly likely that your toddler will experience the digestive viral infection at least once, according to Baby Center. The stomach flu, or viral gastroenteritis, differs from the influenza virus, or flu. Gastroenteritis is a viral infection of the intestinal tract. The infection typically causes symptoms in toddlers for one to two days and is highly contagious. One of the best treatments for toddler stomach flu is to modify the diet. Most of the treatment for the stomach flu in toddlers is designed to minimize symptoms of the illness, according to Kids Health. The most common symptoms include an upset stomach, nausea, diarrhea, vomiting and fatigue. If your child develops blood or mucus in his stools, call your doctor immediately. This may be a sign of a more serious condition. Symptoms can come on suddenly and last for up to three days, but they might also disappear within a day. A fever is not common with the stomach flu; call the pediatrician if your child runs a fever with a stomach flu. 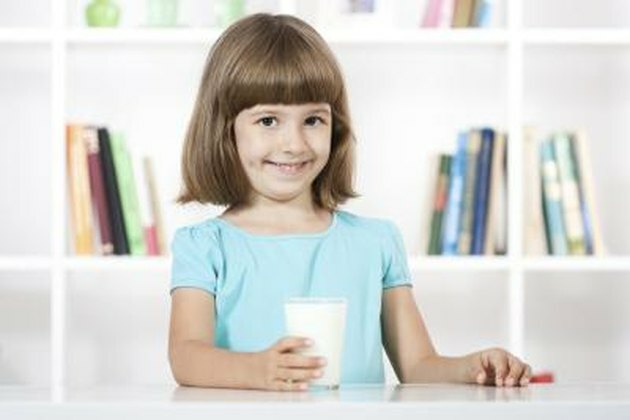 Kids Health recommends eliminating all solid foods from the toddler's diet while she is vomiting. Once the vomiting stops, you can introduce bland foods in small quantities. Introducing foods too early can cause the stomach to become upset and perpetuate vomiting. FamilyDoctor.org recommends implementing the BRAT diet, although not all doctors still recommend this. BRAT diet is an acronym that stands for bananas, rice, apples and toast, foods once though to promote bulk formation, which decreases diarrhea, although there's no proof this works, according to the the Children's Physician Network. Follow this diet for no more than one to three days, the organization advises. Talk to your pediatrician about his recommendations for a stomach flu diet. Liquids are an essential aspect of your toddler's diet during the stomach flu. Excessive vomiting and diarrhea can cause your toddler to become dehydrated, Baby Center warns. Give your child increased liquids, such as water, sports drinks and child-oriented electrolyte-infused beverages. You can also use ice pops to help maintain the proper amount of liquid in your child's diet. Stay away from excessive amounts of fruit juice and do not give your child soda; both contain large amounts of sugar, which can worsen diarrhea. Dehydration is the main concern associated with the stomach flu in toddlers. This condition can lead to brain damage and death if not properly treated. Baby Center says common signs and symptoms of dehydration in toddlers include sunken eyes, wrinkled skin, decreased urination, excessive fussiness or sleepiness, crying without tears, dry lips, dry skin and extreme thirst. Call your doctor immediately if your child shows signs of dehydration.